If you’re like us, you’re impatiently waiting for spring to, well, spring. And what better way to pass the time than to sip refreshing, floral drinks that bring all the feels of a new season? Enter: Kyoto Fizz – the newest addition to our seasonal cocktail list and the answer to shaking away the winter blues. Ditch outfit layering and sub in cocktail layering. The Kyoto Fizz starts with a base of yuzu: a tart, fragrant, Japanese citrus fruit with similar characteristics to lemon and grapefruit. Next comes white peach, known for its delicate flesh and sweet fragrance, to balance the punchy yuzu flavour. Floral notes of chamomile and butterfly pea flower round out the mix, adding dimension and a striking bright purple colour. 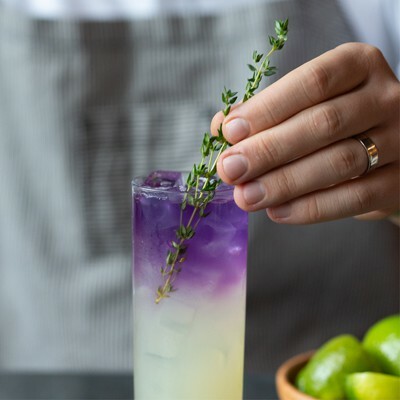 In combination with vodka, traditional Gekkeikan sake enhances the herbaceous profile of this Japanese-inspired cocktail. 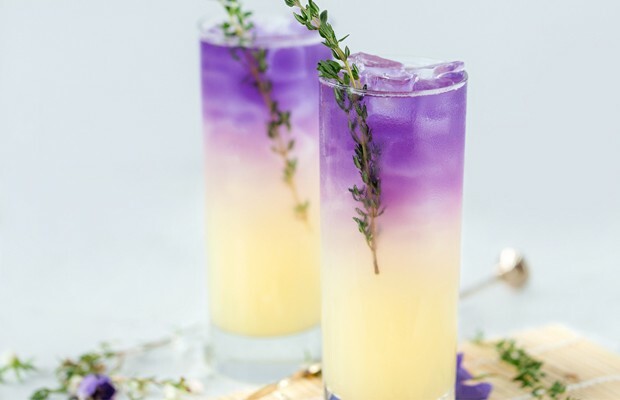 You may be thinking, “this looks too pretty to drink”. But trust us when we say, this drink is as delicious as it is beautiful. Pair it with the Tuna Tataki or Tuna Poke Bowl for the perfect spring combo. Bonus: the Kyoto Fizz is available during Happy Hour at all locations. Go, go, go.